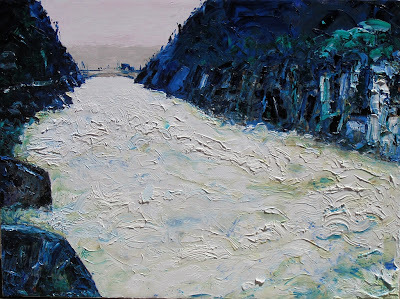 tachisme: Cataract Gorge in flood, "Wild Water"
This recent painting is my celebration of the Cataract Gorge in flood. 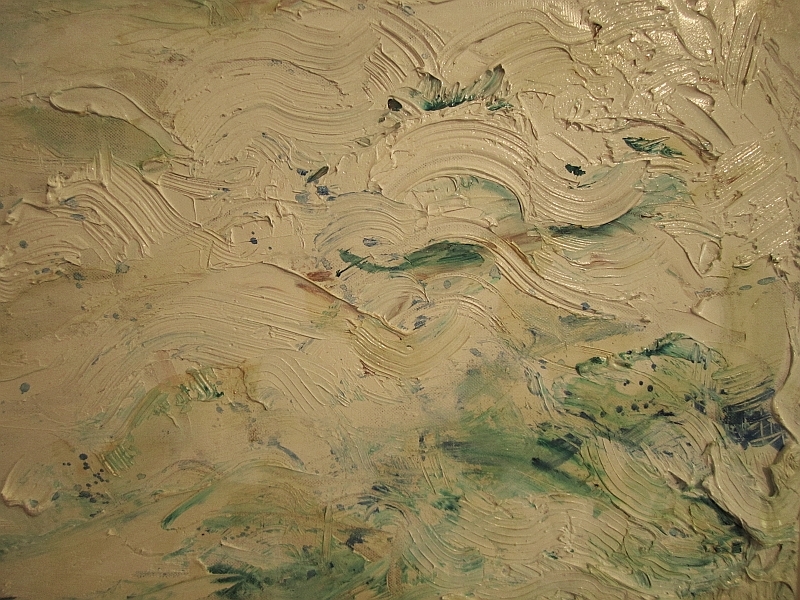 The paint was applied with abundance, vigour and speed in the spirit of the raging waters themselves. I entered this painting in the 2011 Tasmanian Art Award, 9 April to 17 April, where it presently hangs with a satisfying red sticker on the label. The Launceston Cataract Gorge is an amazing place , all the more so for being adjacent to the CBD. Tamed to a sedate trickle by hydro-engineering and picnic tables, the Gorge patiently dozes under the keel of tourist boat rides. But annually it wakes, shakes off the tourist excursions, and rages towards the city centre to surge spume under Kings Bridge. Alongside observation platforms its waters heave and buck with gouging force, brown with mud, whipped white with unpenned fury (see a Youtube clip). In this spirit, the paint was liberally applied with energy and speed. Picasso once said, "If I paint a wild horse, you might not see the horse... but surely you will see the wildness!". I made that my aim. Stylized dark and brooding rock forms combine with stylized swirling and roiling white marks for water to create a composition of diagonals, a wedge driving inexorably towards the light - and towards human habitation. Locals make the annual pilgrimage, bringing their children, just as they were brought when they were children, to do homage. They stand, spell-bound and silenced by cusec thunder, awed by primal force, elated and unnerved by the Untamed and the Unstoppable. Painted last December. The labour on this painting was one of the reasons why my portrait production dried up at the time. 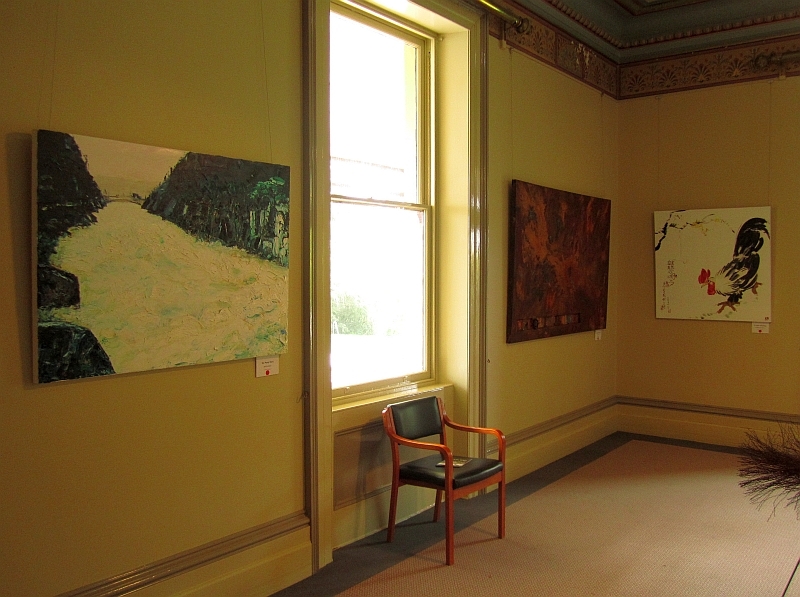 I had sold an oil landscape the previous year at the the Tasmanian Art Award but that was significantly smaller in size. I figured i haven't got time to waste, so went for broke. Uau!! Me gusta mucho. Las dimensiones son respetables. Bravo. This is indeed a great painting. Great color harmony in the trees. By the way, if you have or haven't known I have this painting blog, you might want to check it out if you have time. Thanks! This is such a strong painting, Harry. Very expressive as is your way. I'd love to take it in at full scale. I feel like I can hear the crashing and pounding of the water. What a great force of nature... both the water and you! Thanks, Laura, glad you like. Hi Daniel. Thanks for visiting my blog and finding something to like in my work. And i enjoyed checking out your teaching blog and seeing your immaculate traditional realist works. You certainly are a master of medium and so your kind comments are all the more valuable. The direction of both my landscape and figurative work will be towards abstract expressionism and so currently i'm struggling to leave picturesque realism behind. Wild Water, though stylized, is still a naturalistic work. It's hard to break free and break through in my search for a pure emotional response, and an authentic expressive style that has impact, has something original to say, yet remains an accessible communication to most viewers. Gracias, Manel. Debo admitir que el tamaño hace que el trabajo un poco de una lucha. Los vapores de la pintura sólo eran difíciles de manejar, haha. Hi Annette in far away London. Yes, Home. Can you hear it calling, like Mole did in Wind In the Willows? Me alegro que te guste, Mercè. Thanks Blanca. I had a lot of fun getting down the marks for water, used a wax extender to make the oil paint really soft and buttery while still retaining the peaks of the paint knife marks. Glad you said that about full scale, Nicki, because the photo doesn't really capture the painting. 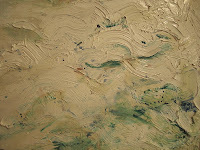 I photographed it with oblique sunlight to highlight the texture, but scale is an essential part of the viewing. It's seeing the swirl and movement fill your field of view in a large expanse of paint that makes it a monumental work rather than just a simple, boring image. Thanks. I imagine standing in front of this painting would be like standing at the precipace before vertigo takes you over into the water, swirling, moving, rushing - you've captured that beautifully, Harry, and congrats on the show and the sale :) Always nice to see those red dots meaning a sale has been made. Congratulations on your painting and its sale, Harry. Thanks, Rhonda. Though you mentioning vertigo reminds me of how i had to hang onto the easel to steady myself as i worked. Maybe some of that creeped into the work . And yes, red dots are nice and of course i'm pleased. But it's not why you and i paint, and it is not the measure of the merits of the work. I have a second landscape in the same exhibition (will get a blog post up about it shortly) and in many ways i think it may be a more successful painting. But there you go. Great to see your lovely ravens up in exhibition too! Thanks Richard. I enjoyed discovering yours in the room next door too. Don't know if anyone told you, but the judges mentioned you and your "Cold Tea, Chestnut" by name and commended both at the awards ceremony. And FNQ to you too! LOL. Though i am wondering how you are coping with the heat and humidity after your cool Riverside garden. Thanks Harry. I received a text update and I phoned David Lake to congratulate him on his win. It's quite warm up here, but the humidity isn't that high and Val and I are coping well. I'm on my second drawing since our arrival as I intend to enter a major exhibition up here early next month. Really terrific painting, bold and strong! Are you feeling like that now? Hope so. I really like to see the size of the work hanging in the gallery. A real eye catcher - it just had to sell. Congratulations! This is what makes me happy - a beautiful work in a grand setting, and better yet, a red dot! Well done, my friend! I love the texture, the size, the composition and the title of this piece. I come from a state where white water rafting is a big sport, and I can look at this and feel the spray of the water and the cragginess of the rocks. Excellent! Harry, I don't know what moved me more - this beautiful forceful painting or your equally expressive description of its background history and aesthetic genesis! Very interesting what you said about engaging a landscape temporarily displacing the portrait side of your work...I think working in various subjects and media can be so enriching. But one has to have a vast imagination and flexible talent to sustain such variety. Thank you for being proof positive! Thanks, Carolann. 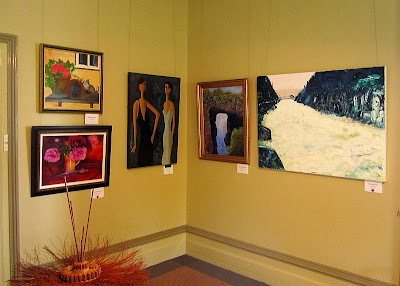 Yes, the painting was nicely placed by the curators. Unforntunately, my other one is stuck in a far corner, which is a pity because it needs a long approach. But i'm lucky to even get a good billing with this one, so can't complain. Thanks Brian for your enthusiasm. Occasionally they run an extreme kayaking events and held the 1992 the World Cup Slalom here in the Gorge. Exhilarating. Thanks Gabriella, youre so nice about what i do when really it's just what i do. Your own writing is so fine, engaging, celebrating all that is human, that your kind words have extra value for me. Ta.